It rains here. A lot. This was the state of the weather at about 18:15 today. It was like this when I left for work, managed to be sunny at lunchtime and then started to chuck it down just as I was leaving the city centre. As I’m not fitness-mad enough to go running when it is coming down like the end of the world, I find myself with a spare ten minutes (or longer! 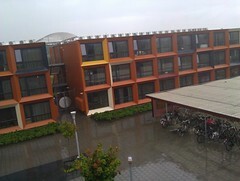 It rains so much here! It reminds me of being a kid in the North East of England) and realising I’ve not blogged in a little while. Things have been pretty calm since getting back from Calabria so there hasn’t been a lot to write about. I had a horrible patch of homesickness/insomnia at the end of last week but it seems to have gone away for now. I try /not/ to blog when that sort of thing is going on as I know I get very introspective and blithering away on the internet about that sort of thing isn’t the best thing for me. I’ve also had the urge to write: not like this, but poems, or something creative, but that tends to be a fairly bloody process too; nothing ever seems quite adequate. I used to write a lot when I was a teenager. I guess that’s fairly typical of middle class teenage angst: I was going to be a writer that changed the world, inspired revolutions, had tragic and compelling love affairs. I wonder if in part the thing that holds me back from writing expressively these days is a loss of that bolshy, almost arrogant confidence I seemed to have between the ages of 13 and 17? I was massively socially insecure and had major self esteem issues, but I was still convinced I was going to change the world one day. I was a one-woman-army…. The social insecurities are there, but different. The self esteem issues are massively improved, but I wonder if that creative block I struggle with is because I’ve lost that bolshy 15 year old me who really thought she’s lead a revolution some day? Like I said- lack of sleep leads to introspection. Sorry for the rambling. It was relatively quiet at work, but things are picking back up again and this afternoon I actually said ‘no more data please, I need to understand what we’ve got so far’… so it looks like I will go on fieldwork in October, but with very specific work plans that mostly involves mopping up little bits from the last two campaigns. That way I can spend the winter working on what we already have, which will include a bunch of lab work, and then in the spring we can decide what to look at next. I think every so often you have to take a step back and try to make sure each plate you have in the air is up there for a reason; that each bit of survey or experiment you do fits in to a wider research plan. I’ll work on this during the week, along with a major re-structuring of the data we have collected so far. Restructuring is necessary- I’ve been working ad-hoc so far and it will be good to impose some order on it all, and it has made me think about the architecture of it all; how surveys and ceramic sites interrelate, for example. So it’s going to be an intensely cerebral week. Expect exasperated tweets by Friday! I’m also going to Turkey for ISAP, which is exciting but a little daunting- it will be the first time I’ve needed a visa to travel, and I am going on my own (though I’ll know plenty of people when I arrive). If you are going too, drop me a tweet or a comment and we can arrange some sort of meet-up! The rain isn’t showing any signs of stopping, but it is getting a bit less. I think I might have to brave it and go running in the wet. I started exactly two weeks ago, the day after I got back, and this will be the 7th run. I’m following the couch to 5k plan, and so far it seems to be doing what it says it will; each week I start a new ‘routine’ and the first time it kills me, and by the third I am thinking ‘I could have done a bit more’….. I’m not looking forward to week 5 when I’ll run 20 minutes solid for the first time (probably in my life) but I am really determined to see it through. I’m already seeing and feeling differences. Swimming and biking are also good, but they don’t quite have the same ‘O my god are you trying to kill me’ effect on my cardio vascular system! Matt is coming to see me next week and I am getting very excited about it! We’re going to Artis Zoo in Amsterdam and a big theatre/arts festival up here. OK, I think it is raining less…… wish me luck!